for flags. State Flags are displayed in order as they entered the Union. Car Flags are often displayed to represent of an individual's allegiance to their state. New York State car flags are used by their owners as mobile emblems of their home. Car flags are usually made from strong materials and are attached to a car via a pole and clip window attachment. What is the design of the New York state flag? 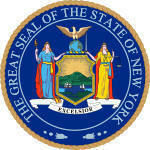 What does the globe symbolize on the New York State flag? The globe is symbolizes worldliness & world travel. "By exhibiting the eastern and western continents on the globe, the old and new are brought together"
What does the two female figures symbolize? The figure of Lady Liberty is shown holding a staff topped with a gold liberty cap. Similar caps called the pileus were said to be worn in ancient Rome by slaves who had won their freedom. A royal crown lies at the left foot of Lady Liberty, thrown down to represent the overthrow of the British monarchy in the War of Independence (1775–1783). Justitia holds the scales of justice in her left hand is depicted wearing a blindfold representing objectivity, in that justice is delivered impartially, without fear or favour, regardless of identity, money, power, or weakness. In her right hand she holds a gold handled sword that represents her readiness to fight tyranny. 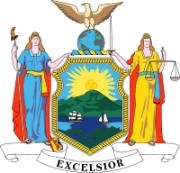 What does the image in the shield of the New York State flag symbolize? The image depicted in the central shield depicts the Hudson Highlands, the sun and a ship and a sloop sailing on the Hudson River. Who designed the New York State Flag? 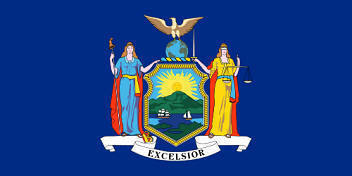 What is the history of the New York State Flag? 1896, the legislature adopted a law changing the white to a buff color to match the facing color of the uniforms worn by the troops serving in the Continental Army. The New York flag is kept and used as required by the code specified in the constitution of the state.